Jess and George win the Albert Palmer Photography award for the biggest wedding party. With 8 bridesmaids and 14 ushers they outnumber the previous best set in 2011 by at least 3 people. 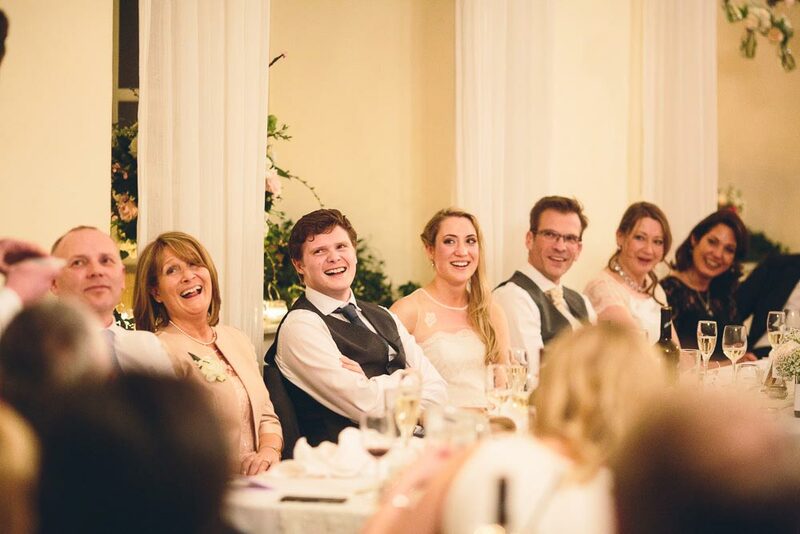 With all these people my job doing Brympton House wedding photography was a ball. Friends and family coming from far and wide filled out the expansive house. And I’m not sure the word expansive quite covers Brympton House. It has so many little hidden little spots for photos. Rooms that have great light and a cosy feel. I’d not met either George or Jessica before the wedding but I took an instant like to them both on the day. A really warm couple with big hearts I was made to feel instantly at home in their company. I think my favourite moment of the day was George’s discovery that their wedding cake was in fact Battenberg cake. In my experience it’s rare I see either the bride or groom get particularly excited about ‘cutting the cake.’ I mean, everyone likes cake – but these two took their duty pretty seriously and with much gusto. My second favourite moment was the ceremony. Specifically the beginning where George’s father played piano to the arrival of the bridesmaids. With Jess and her father last of all it got pretty emotional! Anyway, a huge thank you to their family and the lovely staff at Brympton House for looking after me and helping me. And of course a massive congratulations to Jessica and George – if only we could do it all over again! If you’re interested to see some more of my work as a Brympton House wedding photographer and also Ellie and Rony‘s yellow themed wedding! Lovely work Al. As per usual you always seem to find the heart and soul of the weddings you shoot. Love those sun kissed portraits too! Beautiful! That’s a great set of images Albert. Lots of life. Oh WOW Albert! Love everything about this wedding – so many amazing moments and (yet again) you’ve documented it all so perfectly! So good Albert, wow. I do adore your work friend!! Love, love, love your clean and gorgeous compositions. You really pull us into the moment! Esp love that shot of the couple in the row of trees; what a great wedding! Love this Bert, you really can get a feel for the emotion and heart of the day. Beautiful. You can really feel the love through the images captured!! The portrait shot at the treeline is museum quality! I can’t get over how stunning Emma is, wow! These are gorgeous as always! The ceremony exit high five got me grinning ear to ear. So many well timed moments you’ve caught! Nice work! I feel like the groom and want to high five you right now…killer work man. Truly killer.